What actually is a power cart? 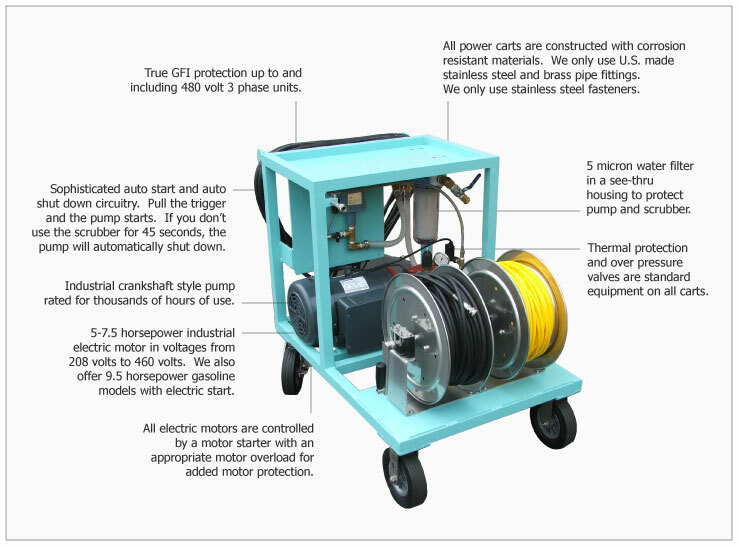 A power cart is required to power any of our water hydraulic scrubbers. What actually is a power cart? To put it simply, a power cart is a very sophisticated pressure washer unit. Our power carts are made of the highest quality materials available and are designed to safely power our water hydraulic motors. Water hydraulic motors are very precise pieces of equipment and will last for a very long time if used properly. All of our power carts have been designed with the water hydraulic motor in mind. We have incorporated numerous safety features to insure the operators complete safety along with dozens of features that safeguard the longevity of the water hydraulic motor. Below is a list of reasons why our specially designed power carts should be used instead of a pressure washer.